Taking your skills to the next level.. for ultimate success! Deborah's students, clients, professors, and colleagues say it best when singing her praises and sharing just want she has done for them. 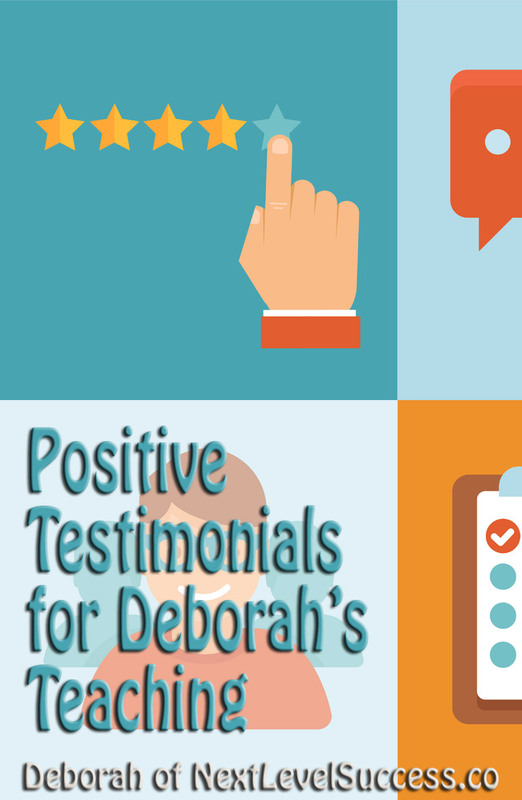 Check out their testimonials about Deborah to see for yourself. Deborah has been an instructor in many areas: Computer, information technology, programming, advanced web design, Adobe Photoshop (and advanced Photoshop techniques), and the list goes on and on, including music theory, piano, flute, and her own HangoutQueen product, as well as coaching graduate students in how to collect and analyze statistics for Doctoral level research. Are you interested in that one-on-one coaching to help you get the “A” that is mentioned in this testimonial? If so, read a bit more about her successful coaching it and then visit Deborah’s appointment schedule program and set up your time slot. It isn’t free, but there hasn’t been a dissatisfied student (or instructor) in the bunch, yet! Check out what her students and instructors say about her tips, strategies, and teaching skills, development of curriculum, and presentation (resulting in A grading for the students!). As the professors mention, with Deborah at the helm, they didn’t have to worry, knowing it was covered. About the author: Deborah has taught many different topics, including Advanced Photoshop, SEO, as well as writing her own books, workbooks, curriculum… She is ready to lead you through the challenges you face. But first, download the “Boost Your Energy” ebook (absolutely free!). This site rocks the Patron Skin for Thesis.